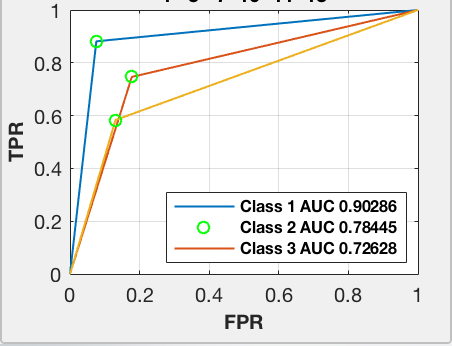 I am plotting "perfcurve" but class 2 is shown as a green circle in the legend. How can fix it? Thanks for the help. can you provide all the datas? The first pair of coordinates FPR,TPR does not have a linespec after it, so it will be plotted with the default color. The second pair of coordinates OOP(1),OOP(2) has 'go' after it, so that point will be plotted as a green circle. These create two different "primitive line" objects. When you then legend() with three strings passed in as Legend, MATLAB takes the first three graphics objects as being the ones to place the legends for -- so the first line, then the first green marker, then the line of the second class. And that is what will appear in your legend.